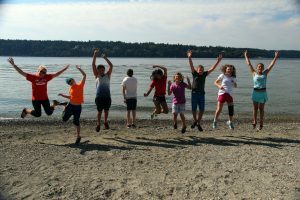 Camp Sealth’s longstanding commitment to diversity and inclusion make our summer camp a unique and fulfilling place for all campers. We take pride in providing a high quality camp experience for children of all ages, encouraging them to try new things, make friends, and develop a sense of independence. 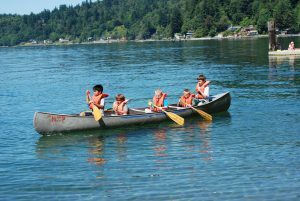 Founded in 1920, Camp Sealth is one of the oldest and most successful summer camps on the West Coast. Sealth is located on Vashon Island, with over 350 acres of pristine forest and 1.5 miles of private beach on Puget Sound. Camp Sealth is accredited by the American Camp Association, meeting hundreds of standards for safety and program quality. We offer affordable sessions and financial aid for families of all income levels. Programs are available for youth of all genders ages 5 to 17, with sessions ranging from 4 days to 2 weeks. We invite you to explore the website to learn more about our programs! We invite you to visit camp before you attend this summer. We offer two Open Houses in the Spring and Summer, during which you can take a tour, try out a few activities, meet some of our summer staff, and have all of your questions answered. If you can’t attend one of these Open Houses, find out how to Schedule a Tour to have one of our staff show you around camp. Camp Fire believes that all kids, regardless of their financial situation, should be able to experience the magic of camp! Financial assistance is available for families in need thanks to generous donations from businesses, community organizations and friends of Camp Fire.